Good morning everyone. Pour your coffee, and we’ll chat a bit. If we were having coffee, I would tell you that I slept late this am. The week was cluttered with lots of demands at work. Then there is the Blogging A-Z Challenge. Most of the game and language research is complete, and I had wisely written up a good head start. I am stuck on two languages, though. Can anyone translate Hello friends and Goodbye in Hebrew and Nigerian using English letters? 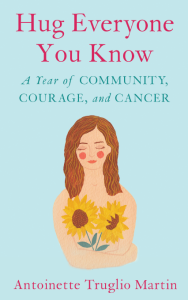 My article, In Praise of Hugs, was published in the Spring 2019 issue of Breast Cancer Wellness Magazine (page 36). Scrambling to get the article written and submitted last month was worth the work. The Long Island Author Fair is today. I do not have a table set up, but I do want to hear a few presentations and meet some fellow authors. My parents arrive home today from their winter exodus in Florida. I can’t wait to see them. They have been away since late January. They have a sweet condo looking out over the inter-coastal waterway. Dolphins can be watched from there backyard swimming and feeding every morning and early evening. A variety of relations and forever friends live close by so that there is always an adventure or party. It is very nice, but now that it is spring it is time to reset. My parents are the center of the family. They keep me and my sisters’ and brother’s families knitted with each other. Although we do get together and plan with each other while they are in Florida, it doesn’t feel the same. My parents are always missed. Today, we will let them settle in and get reacquainted with their cat. Tomorrow, everyone is coming to my house for Sunday dinner. I have to clean and shop today. Sleeping in an hour may have been necessary, but now I have to make up for lost time. Thank you, Everyone, for stopping by. As always, BIG THANK YOUs go out to, Eclectic Alli for managing Weekend Coffee Share. Have a good week, Everyone. Make it great. You are so fortunate to have your parents still. Ours were very much the same in keeping the family together with events and such. It was a blessing to have such great parents and it sounds like yours a of the same cut of character. Yes, my parents are incredible. I am so fortunate. Sounds like you have a wonderful dinner gathering planned! Enjoy catching up with your folks.. ❤ You are indeed fortunate..
Sunday family dinner sounds wonderful. Hope it is a good visit.